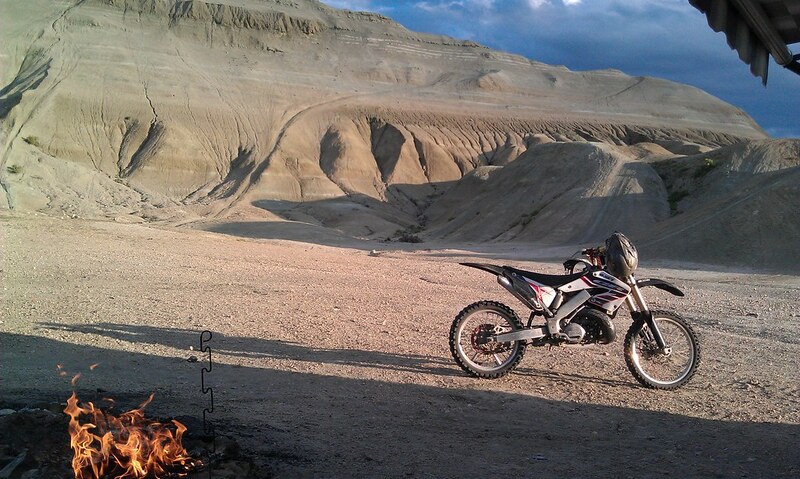 This riding area just outside of Mountain View Wyoming, commonly referred to as the badlands is a favorite of ours for sure. The terrain is very similar to Caineville Utah but at nearly 7,000 feet in elevation the temperature is normally around 10 degrees cooler than Utah valley locations, and it's much closer for us. Even though the terrain is very similar, there are some differences to Caineville. At first glance you will see massive hill climbs among mud flats and brush, but as you venture further you'll find that there are many trails around the hills and even more on top of them! The hills here tend be less abrupt on the peaks than Caineville and I find myself not having to be as cautious as I crest hills as most of the trails continue on over a more gentle top. The peaks do look intimidating and often require skill and a strong bike, but don't overlook what is on the top that often goes unseen here. I hear that this is where they use to hold the hill climb competitions that now take place near Morgan UT. There are some great hills here and more than enough to wet anyone's appetite. Since this is Wyoming it does require a separate permit to ride here if you are coming from Utah. These can be picked up at the maverick in town. Beyond the extra permit however, we find it fun to pick up some fireworks along the way. Check local conditions, but most of the year fireworks are legal in Wyoming. Best Time To Ride: Early Fall, Late Spring, Summer. Type: Clay, grey shale. Singletrack ridges, hill climbs, and double track.